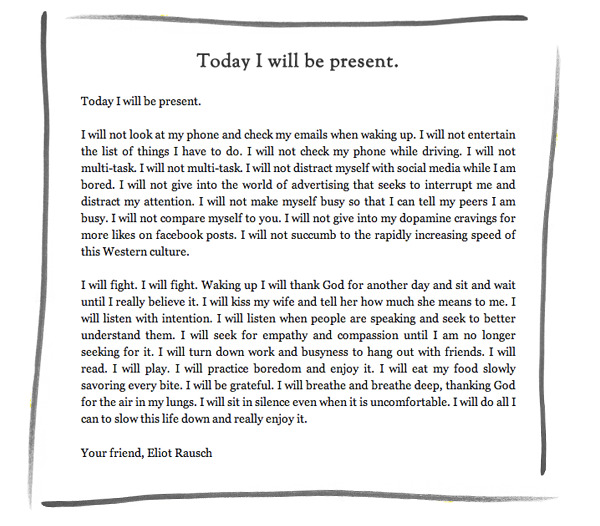 E shared this post written by Eliot Rausch last night over dinner. The words are simple, the concept even simpler, yet there I was.... feeling ever so guilty and ready to declare war on the speed our lives are moving. We always vow to do this more, don't we? It's like a New Year's resolution. Nothing like the impending countdown of bringing your first child into the world to make you start evaluating how you spend your time, how you're going to spend your time and where on earth has the time gone. Could swear I just got my braces off, passed my driving test and graduated from college. Most days I'm not convinced I'm old enough to be a 'mom'. Remember when thinking someone who was twenty-seven was so old? My college aged babysitters used to be so old to me. Now, I will be viewed as so old to an army of punk teenagers as I push a stroller through Brooklyn. A baby forces you to evaluate a lot of things. What... that world isn't going to be just all about you anymore? I know, hard one to swallow. Especially here in New York, our time is already so contested and fought for on all fronts and from all angles. Our implied busyness is a drug and we've lost the ability to just stand in line for an elevator without having to check our phones. I'm guilty of it. You're guilty of it. But habits are a funny thing like that. How do you make them stop? I remember when email became important and text messages were such an innovative step up from the voice mail, but when did they start to become the rulers of our attention? How about when we're at dinner and get a text message, we feel the need to respond so the person on the other end doesn't think we're rude for our lack of immediate response, but we're neglecting the other fully present person across the table from us. It's a text message, not an SOS. Our attention has just been divided. That's not multi-tasking.... that's just a bad habit we've all seemed to acquire. At large dinner parties I used to make guests drop off their phones in a basket to be left under a bench until they were on their way out the door. I have since ceased doing that as it started to make people have weird twitches. Maybe I'm secretly looking forward to this baby ruling our lives. So finally something with a bigger purpose than our own can be the focus of our days. That we don't have any other choice or desire but to be fully present. So yes, when you need an immediate response, you can call me as my hands will be full with a small human and piles of wet wipes. My hope is that this new chapter will be the catalyst for our habits to be reshaped, because honestly, I'm not sure we'd be able to do it on our own. How do you balance, break habits, fight to stay present?